We’re already moving to a world dominated by amazing high-resolution displays, like the ones in the 3rd generation iPad, retina screened smartphones and 4K and QFHD televisions. To protect these displays and make them nice to touch, and look at, we cover them with glass. Unfortunately, glass comes with an annoying property, it reflects light, making it hard to see behind them under light. Well, a group of researchers at MIT has managed to strip glass from glare, making it practically unrecognizable as glass to the eye. If that wasn’t enough, the new multifunction glass is self-cleaning and anti-fogging. The video below shows how water droplets simply bounce off form the glass surface. 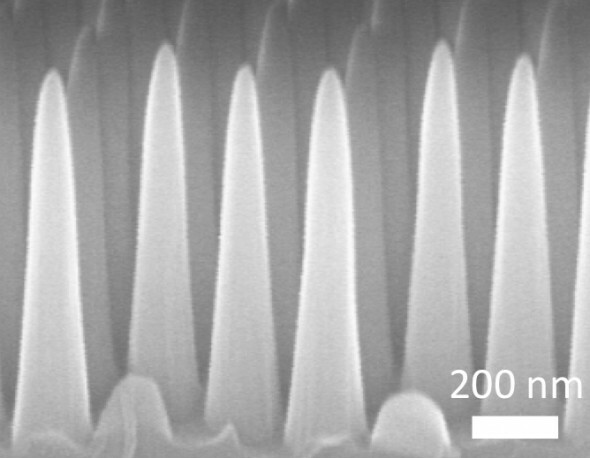 To create this wondrous material, thin layers of material are deposited on a surface and selectively etched away to produce a surface covered with nano-sized cones that are five times as tall as they are wide — the width is 200 nanometers. This is the nanotexture that prevents reflections and also repels water. The researchers are hoping that once an economical manufacturing process is developed, we will ultimately see this glass covering the screens of smartphones, tablets, televisions and even solar panels and car windshields. The glass could also be used for the optics of cameras and microscopes to prevent fogging. Personally we can’t wait. That new iPad is truly a glare catcher.